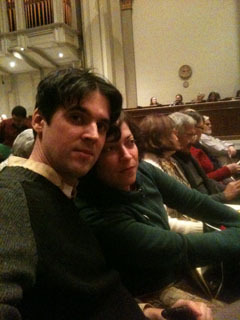 A night of Bach and Mendelssohn to ring in the New Years (thank goodness for pay-what-you-can events). I must say, I’m used to either drunken parties or just spending the night at home wondering if it’s worth waiting up until midnight — this was a surprisingly nice change. More and more I’ve been reading longer works either on the computer (which I don’t enjoy doing if it’s of any length) or printing out things to read. I’ve been writing (and re-reading) more prose in general, illustrating more prose work that others write, and have become friends with more writers and have old friends who have been doing more writing. Therefore I’m debating a b&w Kindle touch. Is it Time? Any thoughts? So, as you may or may not have noticed, it’s 2012. What does that mean to me right now. A couple weeks ago I had a “eureka” writing moment, mostly having to do with the plotting of a story (finally being able to answer my own questions I’ve been asking myself for twenty years), and so I anticipate this year will be a very different (and perhaps very active) year for writing. So far the eureka moment has sustained itself and has not so far revealed itself to be just a I-thought-that-was-a-eureka-moment-but-in-practice-it-really-wasn’t. Happiness for that. Spacetrawler book 2 will wrap up in February, and Spacetrawler-the-project will end (with book 3) probably in the beginning of 2013, so essentially (in my mind) I’ll be finishing Spacetrawler up this year — which means it will be an intense couple of months plotting book 3 (as book 2 wraps up), and then an intense year writing and drawing it. And it feels somewhat momentous, it’s been an exciting world to create and it’s a project I’m proud of and a project people really enjoy, which makes me happy. This ALSO means that I have to be ready to start whatever webcomic I do next AFTER Spacetrawler, and I’m already on my 3rd or 4th partly-developed idea, not sure which dark horse will pull ahead, but it’s a fun exploration which I’ll be fiddling with throughout 2012. Anyhow, thank you all for the support and for enjoying my work. I”m thinking this year will be great, and hope it is for you too. Panel 11 may be my favourite thing ever. Also – while it was always inevitable and it’s at least a year away it makes me sad to think of Spacetrawler ending. Thank you so much and I hope 2012 is a fantastic year for you. Congratulations on Spacetrawler’s second anniversary. Good to see a story moving toward a conclusion. Eeb brainstorming is absolutely fantastic. Do WE need to survive? A good question. Good question, Eebs. Oh, incidentally- is the use of the word “Earth” in panel 5 intentional, or should it be “planet”? Have these Eebs even heard of Earth? I do believe they meant ‘earth’ as in Soil or ground.. rather then ‘Earth’ the planet. On a different note, love your story so far even though this is my first time posting on the comic! I think the Kindle is definitely worthwhile vs. reading on an eyestraining backlit LCD all day. I probably should use mine more. For what it’s worth, I read your comic up until recently exclusively on my kindle — if you decide to get one, don’t limit yourself to plain text! They’re incredible for recipes (although not for marking them up) or for reading emails/feeds. Keep them coming, I can wait to see what is going to happen next! i like their priorities. not that i like beer, i actually hate it, but i like that they’re all in agreement about emphasizing something enjoyable. Oh! Oh! How about a Spacetrawler spin-off? Or better yet, a Spacetrawler-LittleDee crossover? I can just imagine Vatchel’s panic at seeing aliens land in the woods. As for today’s comic, the eebs are really enjoying themselves, are they? Haha, Dimitri is such a great match with eebs. You should consider other options besides the Kindle. Personally I’d look at the Nook – bw or color. The biggest problem I have with the Kindle is the lack of control you have over the books you buy. They stay on the Amazon site and they have control over your access (as we saw in the Animal Farm debacle). The Kindle used to have problems displaying PDF files; don’t know if that’s still the case. The Nook doesn’t. I have other issues with the Kindle but they are more along the lines of aesthetic and that’s a personal choice there. susan: Agreed, the Kindle has some *serious* UI problems. I find I’ve been doing more reading since I got my iPad. It’s a little heavy compared to a Kindle and doesnt have the absolutely insane battery life of one of those, but the Kindle app works wonderfully and lets me shift seamlessly between reading on the pad at home and reading on the Android phone on the bus. Plus it’s a general-purpose computing device. Which can be good, or bad, depending on whether you want the distraction lessens of a single-purpose device. Though I must say, I haven’t really had any problems with sitting down with the iPad for a whole day and reading an entire novel now and then. The iPad is a LITTLE too heavy for long term reading, but only a tiny bit. Today’s page is very funny, made my day. Thanks! Dimitri and eebs are a good combination indeed. It is good to know when this comic is going to end. It’s very wise to stand up and announce it rather than ruin the comic by needlessly prolonging it. I’ve been privileged to follow this comic almost from the start and I’ve been enjoying every page of it. Looking forward to book 2! I love Dimitri and I love the Eebs, too. I’m trying not to think about the end of the story. Did we ever have an explanation once of why the Eebs all wear the same clothes? I’m with Susan. I like my Nook (B&W oldstyle, separate LCD touchpanel at the bottom), and I like the newer B&W Nook (no separate touchpanel, main screen is touch sensitive) even better. Very light, minimalist design. Not good for surfing the Intarblags, but great for, you know, reading. Please do not speak of the End times. It makes me all upset. As for Kindle I love it. Perhaps for the reasons some people don’t. I like that they have all the stuff there in one place and I can send it to my phone, to the cloud reader, to my laptop or my kindle. I read the same book from several places as I move through my day and it means alot to be able to grab the book where every I am. I’m on my second kindle due to dropping my first from a great height onto concrete. If you plan to do that, don’t get the kindle. It doesn’t like concrete. But I got the same basic one, because I’m not a fan of touch screens and the basic one does the job very well. But that’s a person preference. Chris, I’m with the others about the confusion over the use of “earth” in panel 5. I’d suggest that since there is some confusion (I had to take a moment to think about where they were), it might be better to change it to something more neutral like “ground.” Just my 2 cents! Happy anniversary! Keep up the awesomeness. And thanks for all the thoughts on the kindle (or nook). Am still pondering. Don’t get a Kindle. Currently the Kindle locks you into the Amazon format; that is, you have to get the content through Amazon, as Kindle format. If you get something in another format it has to be converted to Kindle format before you can see it. Libraries and Bookstores are pushing for anything except Kindle for that reason. And while the Kindle 2 supports .pdf files there is no magnify option to make a graphic novel page larger than screen size, so good luck reading that small balloon print or asides. I like the 9″ color-capable Pandigital Novel myself, it’s from Canada and supports the Barnes & Noble eBook catalog, as well as being an Android Compatible notepad. I love that I have another year of this to look forward to! I guess it was bound to end sometime considering they way you started the story, what with Nogg telling Mr. Zorilla that his daughter Martina is dead. The entire story basically leads up to that reveal. I’m glad I have another year of Spacetrawler to look forward to however. I really love your humor and wit. I literally laugh out loud at least once a comic. Thanks! Oh, we were voting on removing “earth”? In that case, I cast my vote against. It’s not clearly beginning with a capital (as opposed to the other letters) and, hence, not a proper noun. Ummm, are we sure Nogg *knows for sure* that Marina was dead? I mean, in light of Dimitri already being dead already (in some circles) and all… I can always hope, anyways.